How much "relaxation" can one couple take? "For lo, the winter is past, the rain is over and gone. The flowers appear on the earth; the time of the singing of birds has come, and the voice of the turtledove is heard in our land"
We've saved nearby AT sections to fill the odd weekends and such, so we're dropped this Sat morning by our friend LeFaye at Harper's Ferry, having left a car at our destination. 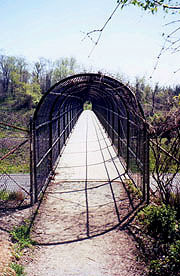 At 12:20 we head across the Potomac railroad bridge on a protected walkway for pedestrians next to the tracks. A freight train passes with dizzying speed just a few feet away, and the walkway is crowded with weekenders of all sorts. It's a welcome change walking with the crowds, and we get the usual odd looks, questions, and comments about our packs and destination. The trail is sandwiched between the sluggish C&O canal on our left and the mighty Potomac to our right. It's exhilarating hiking with the force of the surging Potomac just to our right, although the canal is a continuous breeding ground for bugs, which swarm quickly at every stop. The trail is full of geese (some very cute families waddling along behind, all very accustomed to human presence) along with turtles lined up on various logs there, as many as 6 to a log. As we leave the riverside, a a freight train crosses the path ahead, suitably long for us to take a stand-up lunch. We finish just as the train does (odd - no caboose), and begin the climb up the ridge - a 900' piece of cake, well graded and easy trail. 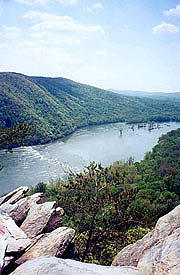 Topping the ridge, a blue-blazed trail down to Weverton Cliffs proves a worthy diversion, with a a commanding view of the river valley. A short struggle with the tripod produces the expected result - one of the day hikers volunteers to take our picture, with typical disappointing results (hence, the above pix). 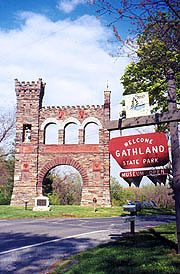 After a while we come to Gathland State Park, finding it extremely well manicured, with typical park amenities, and a pump with sparkling cold water. 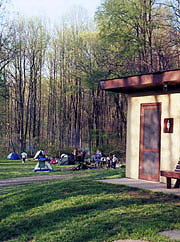 We tank up, continuing north past a small crowd in the picnic shelter, entertaining each other on the ridge walk by reciting song lyrics, poetry, and quotes we'd memorized in school. Any number of beautiful overlooks present themselves on the quartzite cliffs, but we're focused on a goal still 3 hrs ahead. As dusk approaches, a classical station plays the news from Lake Wobegone, concluding just prior to reaching the Dahlgren campsite at 8:03. The campsite's fairly full, with about 6 tents and cooking fires, but far from capacity, and a group at the near end invites us to share their fire. As darkness falls we chat with our neighbors over dinner, finding them a family bringing their 2-yr-old Derek on his first camping experience. Coleen heads up to take her shower (Dahlgren's one of a only handful of campsites on the AT with free showers - a welcome feature), and we share marshmallows and cocoa. After Coleen's return, I head to the showers for my own, meeting some of the CAP (Civil Air Patrol) cadets camping on our other side. It's pretty chilly, with no towels and a gravel floor, but there's plenty of hot water, and we each manage. It's a quiet evening around the fire, and we settle in at an early 9:17.
" Keep close to Nature's heart... and break clear away, once in awhile, and climb a mountain or spend a week in the woods. Wash your spirit clean." My new summer-weight bag is a bit chilly, and Derek's occasional wails make Coleen suppose a wild cat is prowling about. We're finally up at 06:00 with the sky completely light, a chorus of morning songbirds totally overwhelmed by the staccato of a single woodpecker directly above our tent. Our neighbors are up as well, and we start breakfast, Coleen taking this rare opportunity to wash in hot water. We're out at 07:52, passing the Old South Mountain Inn, a beautifully quaint 5-star restaurant over 200 yrs old, which has hosted several presidents, and would have provided an ideal repast last night were we not so grubby and hungry on arrival. After crossing the road, the trail passes an old Gothic chapel before plunging into the woods. The woods are replete with songbirds, the crisp cool of the morning, and all the aromas of spring in the air; with easy trail winding through abundant maples. A populated area ahead reveals the Washington Monument state park - well-marked and maintained, with a campground full of tents and occupants engaged in breakfast rituals � we're snapped back to the reality that it's Sunday morn to the rest of the world. The road to the monument itself is lined with informative signs about Washington's life � a good presentation in that the single fact on each sign (like the old Burma Shave ads) is easily digested at our pace. 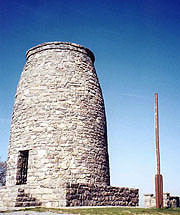 The monument itself is stone, roughly cylindrical, set on a beautiful overlook that beckons us climb to its top. The weekenders are coming as we emerge, and we push on after minimal conversation. During our am break, I bite on a piece of beef jerky with a crunch, finding the temporary crown on my bicuspid has broken into two. This will require a quick repair before my Mon. trip - this is becoming far too common. After Boonsboro Mt Rd is one of the more unusual trail sections occurs - the trail squeezes between a couple houses, winding literally through their back yards, and descending down a stairs to an impressive footbridge across I-70. It's pretty funny, and we ponder how this happened (especially since there's a vehicular road crossing I-70 on a bridge not 1/8 of a mile away), snapping pix and crossing the busy interstate (we wave, but Coleen resists the urge to moon anyone). Another monument picture - is something Freudian going on here? After following I-70 a bit, the trail climbs to Pine Knob - another well-graded and easy climb, and we crank out the miles on the level ridge. We're stop for lunch precisely at noon, just before Black Rock cliffs, soon after entering an unanticipated rocky section of trail which slows us considerably. It progresses from rocky to very rocky to extremely rocky, and seems to go on endlessly, made worse by a pair of weekenders that blast past us (sans packs). The rocks turn us into amateur ballet dancers, leaping between the unevenly spaced rocks while avoiding the more sharply pointed tops (and this in our boots with 30 lb packs on). It's very slow and tiring, but finally it ends, and we eagerly anticipate the trail's final descent down the eastern ridge face. (As rocks go, the worst is yet to come, in the legendary northern PA, "where boots go to die" says National Geographic). It finally comes, followed by an irritatingly long level segment before the steep descent to the road. By 3:00 we're at the road, with the car located soon after, and speeding towards Smithsburg in search of town food. Doug's All-American Fast Food proves almost that, and soon we're solidifying our arteries with the high-fat food and massive cokes we crave - civilization seldom disappoints.